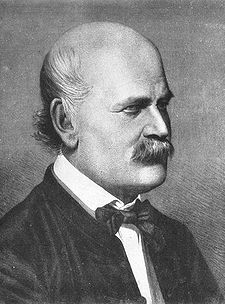 Dr. Ignaz Semmelweis was the Hungarian doctor who first recommended hand washing. Beginning in 1847 he proved that it reduced deaths by 90% in three trials in a row but nobody listened. He died in an insane asylum. He now has a museum, hospital, medical university and psychological condition named after him. "Puerperal fever was common in mid-19th-century hospitals and often fatal, with mortality at 10%–35%. Semmelweis proposed the practice of washing with chlorinated lime solutions in 1847 while working in Vienna General Hospital's First Obstetrical Clinic, where doctors' wards had three times the mortality of midwives' wards. He published a book of his findings in Etiology, Concept and Prophylaxis of Childbed Fever. Despite various publications of results where hand-washing reduced mortality to below 1%, Semmelweis's observations conflicted with the established scientific and medical opinions of the time and his ideas were rejected by the medical community. Some doctors were offended at the suggestion that they should wash their hands and Semmelweis could offer no acceptable scientific explanation for his findings. Semmelweis's practice earned widespread acceptance only years after his death." His story raises the question, how much have we progressed over the centuries? Click here to read a short, informative biography on wikipedia. "The most typical picture of Morgellons patients goes something like this: otherwise healthy people suddenly wake up one day with unbearable itching, stinging, burning and crawling sensations all over and underneath their skin. They also notice blue, black, red, clear, white and purple fibers emerging from, or popping out of, their bodies. They begin scratching and digging at the lesions, pulling out fibers, “black specks,” bugs, worms, and, sometimes, hexagon-shaped objects from different regions of their bodies. Accompanying these symptoms are a host of additional neurological complaints such as headaches, “brain fog,” exhaustion, loss of coordination, and confusion." Click here to read more about Morgellon's and how it is being shoved under the rug by the establishment. Click here to visit the website of the Morgellon's Research Organization to learn more. "...restricting propagation by the undesirables and putting to death infants that didn’t pass the examination." Here are some words from the supreme court justice whose decisions form the precedents supporting forced vaccination. 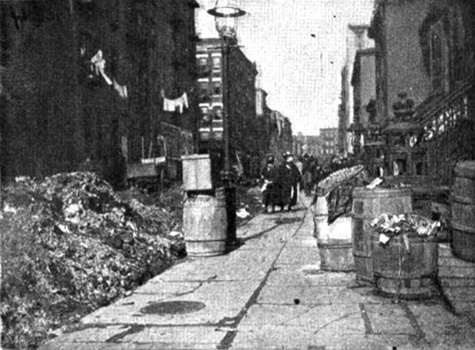 Click here to read this brief, informative history of the sanitation movement of the nineteenth century and its role in bringing the pandemics of the industrial revolution to an end. "Doctors around the world are being faced with children catching the diseases they have been vaccinated against. Rather than diagnosing these children correctly, professionals have discovered that the doctors are giving the diseases new names. This suggests a cover up is going on and the vaccinations we are all being told are safe and effective are in fact completely useless." This has been standard practice since Edward Jenner began vaccinating people at the end of the eighteenth century. Click here to read a well sourced article on the history of renaming polio, small pox and whooping cough. Click here to read an article discussing the decline in infectious diseases. It links to many useful resources. This article offers a great deal of data on the decline in diseases for which we now vaccinate. They declined before we vaccinated. The author cites his sources. Click here for a great set of well sourced graphs demonstrating the declines in various infectious diseases, including ones for which there is no vaccine. Click here for links to Dr. Kalokerinos written works. Click here for a short interview he gave. Click here for an obituary about him. Note how they do not mention vaccines.